The following interview was originally conducted by Patrick Todd and published to Good-Evil.net on July 16th, 2009. It includes a foreword that expresses how it was difficult to find information on Alberto González, though thankfully he now has a page on wikipedia and there are a few more resources available. Some newer, additional information is referenced in a more recent episode of the Retro Game Audio podcast, in Episode 6: Alberto González, where Patrick spoke again with Mr. González in preparation for the podcast. A new addendum is also included below. In recent years I’ve started to become familiar with the charming works of Alberto José González. Digging through various archives of video game soundtracks, I would occasionally stumble across titles credited to his name. Often including a deeper sounding bass and heavier percussion than heard from most other contemporary video games scores, I found a distinct and likeable quality in his music. I’ve also discovered that I’m not the only fan of his, as I’ve seen his name come up in various discussions from different communities across the internet. It would seem that he is often recognized for the quality of his music, in spite of there being little information available on him (at least that I’ve been able to find). Who is Alberto González? I had learned that he is from Spain and composed many soundtracks to games published by the French company Infogrames. I’d learned that his repertoire covered at least 9 different systems, including the ZX Spectrum, Amstrad CPC, MSX, Game Boy, Sega Master System, NES and SNES, first starting in the late ’80s. I also learned that he used the alias “McAlby” or “Joe McAlby” for some of his works. But I knew little else of him, until I had a chance encounter with him online. Mr. González kindly agreed to a series of interview questions via e-mail. I wanted to learn more of his history, hear his perspective on working with various video game systems, and gain a greater knowledge of his complete list of works. I found some of the responses to be quite interesting and even surprising! There is a severe lack of first-hand information regarding this esoteric but fascinating bit of history, and anytime someone can come forward and help bring detail to this widely undocumented culture, it is greatly appreciated. Patrick: Tell us about your musical background growing up. P: What turned you into a musician? Did you play any instruments prior to composing? AG: My birth as a game musician was purely accidental. 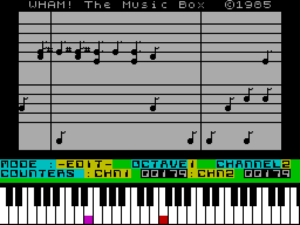 I started my video game career as a graphic artist (or better said, a sprite designer), but someone lent me a copy of Music Box for the Sinclair Spectrum and I started making music with it, just instinctively. Wham! The Music Box. 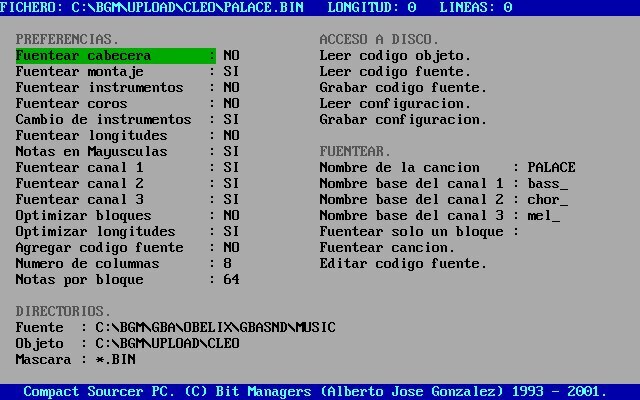 A music writing program for the ZX Spectrum. P: [No, it’s not!] How old were you when you composed your first video game soundtrack? What game was it and for what system? 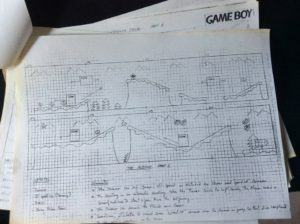 AG: My first published game and complete soundtrack was probably Hostages for the Spectrum, Amstrad and MSX computers, but it wasn’t my first composition. Before that I made some tunes for MSX ports of Spectrum games for the Spanish market, such as Altered Beast, Snoopy, Ghostbusters 2 and Power Drift. I was 16 at the time. P: What bands or styles of music were you listening to at the time, and did they have an influence on your music? AG: My main influences were other game musicians from that time, like Tim Follin, Ben Daglish, Jonathan Dunn, David Whittaker… and I could name all of them. They were my references and I think it’s pretty obvious when you listen to my work. I’m especially a big fan of the Follin brothers, although I think my style is more tilted towards Ben and Jon’s (you can hear some examples of their works here and here). I don’t remember much about “normal” music from that time, I was very focused on computer music, probably too much. Now I realize that I should have listened to other kinds of music and learned more about chords and progressions. 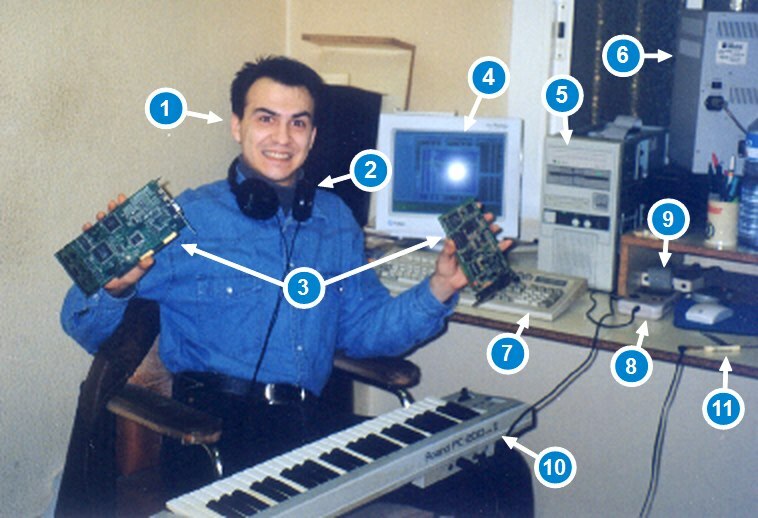 I was a pure chiptune musician, for better or worse. 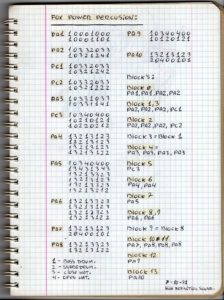 Some people learn music taking piano lessons, I learned it coding my tunes in Z80 assembler. In the second set of questions I began by erroneously asking Alberto about his work with Infogrames. I was reminded that Infogrames was the publisher, not the development teams of which he was a member, and soon after a co-founder. AG: I have never worked directly for Infogrames. In fact, I have never been in their offices. They were the publishers and we were the developers. I started working for New Frontier in 1988. P: How did you get started working for New Frontier? Did you find an ad in the paper that said ‘graphic artist wanted’? Did you go through the standard process of filling out a job application? AG: Much simpler than that. I saw the “New Frontier” name on a mailbox. I remembered that name from a game called “Time Out”. At the age of 16 I didn’t have much of a portfolio, only some sprite animations and pictures I made at home with my Spectrum. I knocked their door, they liked my graphics and I started working the next day at their office (a flat, actually), with my own computer. P: Did you have many coworkers? What was the work environment like? AG: New Frontier was not a company like you would expect, It was more of a “prototype”. Not much later the company started to look more professional, when we were 4 members in production: 2 programmers and 2 graphic artists. We made “Hostages” at that time, our first game for Infogrames. P: Was there ever input from coworkers on how a certain theme or part of a game should sound? Or did you have the freedom to use your own judgement and compose whatever you wanted to? AG: Not much, really, except from one very good producer from Infogrames and occasional comments from other people. I would have preferred more involvement from my coworkers. On the other side, I was free to experiment and to do whatever I wanted. P: Was the pay decent enough? AG: I didn’t start to get paid properly until the end of New Frontier and the start of Bit Managers (which I co-founded). I think the world is full of stories about software companies not paying their employees properly, or not paying them at all. A bit about our story with Infogrames. When we made Hostages it was like an experiment for them. They didn’t know us well enough and I suppose they didn’t take us too seriously. But by the time the game was nearly completed they had no doubt about our possibilities and quality. Hostages was a very good game for the time. Then we made more 8 bit computer games for them like North & South, Light Corridor and Mystical. Listen to the Light Corridor soundtrack. P: If I have this right, you have composed and programmed one or more video game soundtracks for the following systems: ZX Spectrum, MSX, Game Boy (+ Game Boy Color), Nintendo Entertainment System, Super Nintendo, Sega Game Gear, Sega Master System, and Game Boy Advance. That’s quite a few! Am I missing any? AG: I also did some sound programming for the Playstation. In my new company, Abylight, I have composed many short tunes for our Mobile Games. Recently I have also worked with the Nintendo DS and Nintendo Wii as audio engineer and sound effects designer. I work as game designer and producer now, so I’m not involved in music anymore. However I’m still in charge of anything related to sound directing and programming, and I try to help in sound production whenever possible. P: Did you do all of the soundtracks for Bit Managers, or were there any exceptions where another composer or sound programmer was hired? AG: The only exception was BANG! a Coin Op arcade machine we developed for Gaelco. I wasn’t involved in that game at all. Radikal Bikers for Playstation also used the original arcade songs and effects, but I coded the sound in the game. Conversely, I’ve been involved in games that were not developed by Bit Managers. I made the music of many other Infogrames titles for Game Boy such as V-Rally, Looney Tunes – Martian Alert, and some others. AG: There is also The Smurfs Nightmare, which is one of my favorites. AG: The last “true chiptune” soundtrack I composed was Asterix & Cleopatra for the GBA. I had a severe restriction of CPU usage in that game, so I had to use only the hardware (GB soundchip and two PCM channels), instead of audio rendering which was the common method. The programmers didn’t place some tunes where they should have in the final version, so there are songs not used in the game! Although they were composed and programmed. P: In looking up more of your work, I’ve been unable to locate rips for some in their emulated audio formats. For example, of the MSX titles you mentioned earlier, I was only able to locate a .kss file for Ghostbusters 2. For the Game Boy, I was unable to locate a .gbs rip of Looney Tunes – Martian Alert. Would you happen to know if there are more works of yours that are seemingly unripped? AG: There are also many unreleased tunes and earlier works on this page, including a complete soundtrack for an unreleased game named “Sokoban Perfect” which is one of my favorites. But perhaps you will find “Compact Editor” more interesting, it’s the editor I have used for ALL my 8 bit soundtracks, and even the first Game Boy Advance one. There is some info about it on that page. I recommend you the emulator ZXSpin to run these files. P: Wait, so you even wrote NES music, for example, on the ZX Spectrum! Tell us a little bit more about your program Compact Editor, and how it basically functioned. Was it capable of tracking / composing a complete song from start to finish for the rest of your non-ZX 8-bit soundtracks? 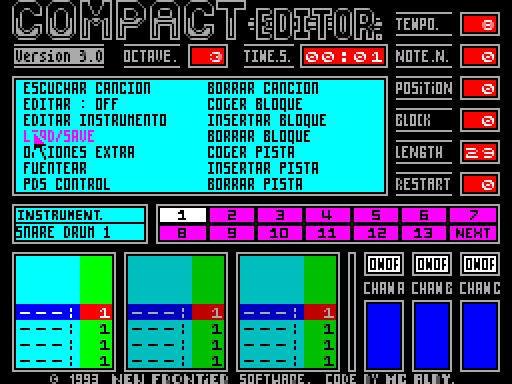 AG: Compact Editor was a simple music sequencer, based on tracks, blocks, and instrument definitions, inspired by some Amiga computer trackers like NoiseTracker. 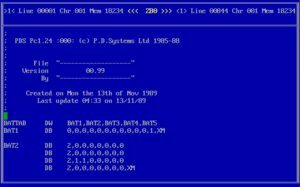 A complementary PC program named “The Sourcer” was used to transform the binary data created with Compact Editor into raw source code, as a text language that I could understand (basic notes, lengths, etc). This way I could then edit the songs into its fullest detail. 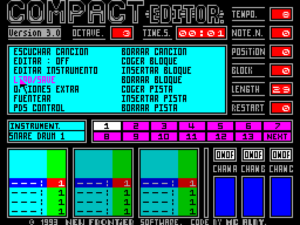 Compact Editor on the ZX Spectrum, created by González to compose for many platforms. AG: My entire process of making music for 8 bit consoles can be elaborated as such- First I used the Compact Editor to compose the basic idea of the song, with its different parts. Later the song was transformed into source code using The Sourcer, and then as a plain text file I put the small details and riffs into the song, as well the drum track and the final sound for each instrument. This process was done by changing the source code, compiling, sending it to the console, listening, and so on again and again until it sounded as I intended (or I ran out of time!). Finally, if required (most of the time), the compression stage took place, which consisted of finding and reusing small fragments of the song to make it use the least amount of memory possible. Many times I adapted the sound driver for each game, adding new commands and effects, drum sounds or whatever. It was an evolving thing. I don’t know how the other musicians did their soundtracks, I’m still wondering, but don’t think it would be much different. P: It appears that you used Compact Editor for almost everything besides the SNES. What tools were used in the development of sequencing and programming the music for Asterix & Obelix? Being primarily sample based, do you recall the sources of the samples? AG: For Asterix & Obelix I used Octamed, a well known Amiga 500 tracker, and I also used a very basic PC midi sequencer. Depending on the song I used one or the other. The SNES development kit had a MIDI input so it worked more or less like a synthesizer in real time. All the instrument samples were digitized from a Turtle Beach Maui PC sound card. For the effects, many were synthesized on the SNES using basic waveforms, and others were taken from many sources, but I don’t remember exactly which ones. As for the Game Boy Advance, after the first GBA soundtrack, I programmed a synthesizer for PC which faithfully emulated its sound hardware. I could compose the songs using a MIDI sequencer and listen to them in realtime. P: Did any systems have your favorite overall sound? Were any limitations harder to work with than others? AG: The NES had something special. The triangle wave channel was a good source for percussive sounds and boomy basses, although it wasn’t very usable for other kind of sounds. I really enjoyed doing the music of Asterix & The Smurfs. Solstice by Tim Follin was my inspiration at that time. I had to learn 6502 and I liked it much more than I would have imagined. AG: The Game Gear sound chip couldn’t produce sounds below a certain frequency, so I found it quite limited for my music style. Later on I knew about a trick that allowed to produce sounds at lower frequencies, but the games were already finished. In most cases (when a game was released cross-platforms), I composed the Game Boy tunes first, then I converted them to the other systems. However, due to differences in sound among the consoles I used to compose different tunes to take advantage of each sound chip. The SNES sound chip was amazing, a true masterpiece. I only made one soundtrack for it, Asterix and Obelix, but I enjoyed it immensely! Alberto circa 1995, around the development of Asterix and Obelix. P: What made working with the SNES enjoyable? AG: The sound of course! It was like a true sampler, only with 64k. It also had that DSP that allowed to put interesting effects to the sound. 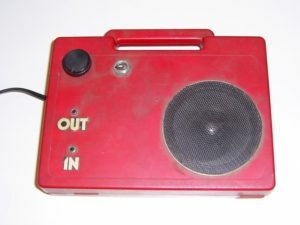 The sound chip was like a complete computer with its own CPU, RAM and audio DSP. You were free to do whatever you wanted. Usually you would be restricted to use only a portion of RAM and CPU usage, but with the SNES that wasn’t a problem. The console for which I have done most of my work is the Game Boy, and I think I’ve done almost all that one can do with its sound chip, except for sample playing and streaming due to memory restrictions. Talking about limitations, the most limiting factor has always been the memory. Our 8 bit soundtracks were restricted to a maximum of 16k of ROM for the sound driver, music, and fx together, and very low RAM use as well. So I had to come up with strange techniques to fit all the content into that tiny size, especially in the games that had more tunes and effects. Many times I had to lower the quality and detail of the music to fit it into the memory. Despite everything, I love the sound of all of them, each one had its own charm. P: Did any of the systems’ companies (Nintendo, Sega) provide assistance for development? 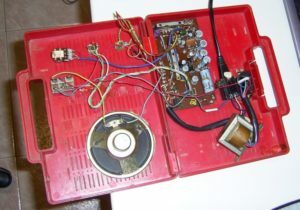 Was Bit Managers provided with anything like devkits for the NES or Sega Master System? The “Albyfier”, or “Albyficator”, built by myself using a case of pencils and the circuit of a radio found in a trash bin. Attached to the Spectrum +2 audio output, I used this to compose music using headphones instead of the TV speaker. Very appreciated by my fellows at work. 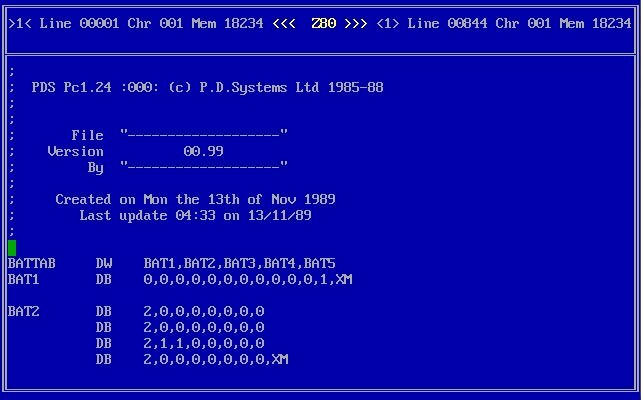 The PDS (Programmers Development System). I used this editor to program for Spectrum, Amstrad, MSX, and with some modifications also for Game Boy, Master System and NES. “The Sourcer”, used to convert the binary data generated by the Compact Editor into assembler source code for further edition. Picture taken around 1995 at Bit Managers. 1) Average programmer / musician in his mid-twenties trying to make a funny picture. 3) Probably a pair of VGAs, nothing related to sound actually. 4) “CED”, a MIDI sequencer for MSDOS I was programming at the time, but never used in a production. 5) Sub-standard PC with a Sound Blaster 16 and a Turtle Beach Maui sound card. 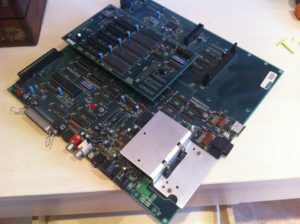 6) SNES development kit, which was being used to compose the soundtrack for Asterix & Obelix. 7) Greatly missed PC keyboard, with proper key action and feeling. 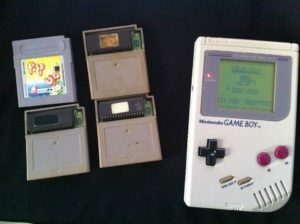 8 ) The one and only Game Boy used to compose 27 soundtracks. 9) 32k ROM emulator for the Game Boy. 10) Roland PC 200 mk2 MIDI keyboard (still working!). 11) Indispensable screwdriver which still serves its purpose faithfully since 1989. Game Gear development board, used to compose music for 3 games: Tintin, Smurfs and Spirou. Like all development boards, this thing was HUGE! These disks were used to save save the graphics for ZX Spectrum and Amstrad CPC. They contain mostly graphics for Hostages, North & South and Magic Johnson. Graphics in both systems were completely different. These disks where used mostly for sound and music, but there’s a bit of everything in there. 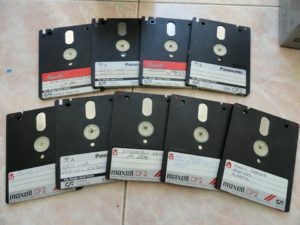 My computer was a 4 mhz PC at the time, with no hard disk. 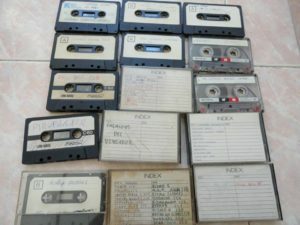 In the very early days I used tapes to save graphics and music, but they were highly unreliable. 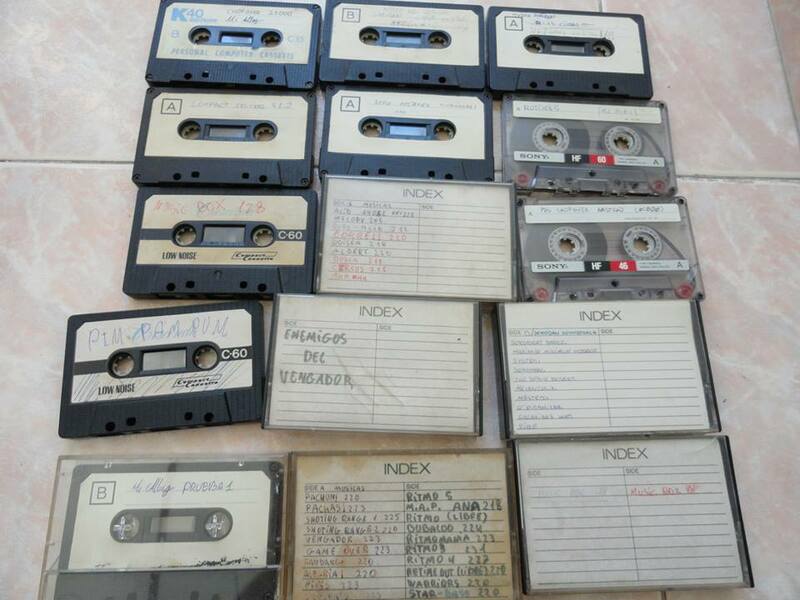 Some of these tapes are from before I started working at New Frontier in 1988. Prototype ROMs are from Smurfs, Asterix, Bomb Jack (in the console) and a sound tester I used to experiment with the sound chip. At the time you had to use an EPROM programmer to flash the prototypes. 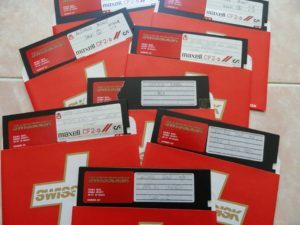 There was no email or Internet as we use today, you had to flash an EPROM and send it to Infogrames via regular mail so they could check the game while we were developing it. 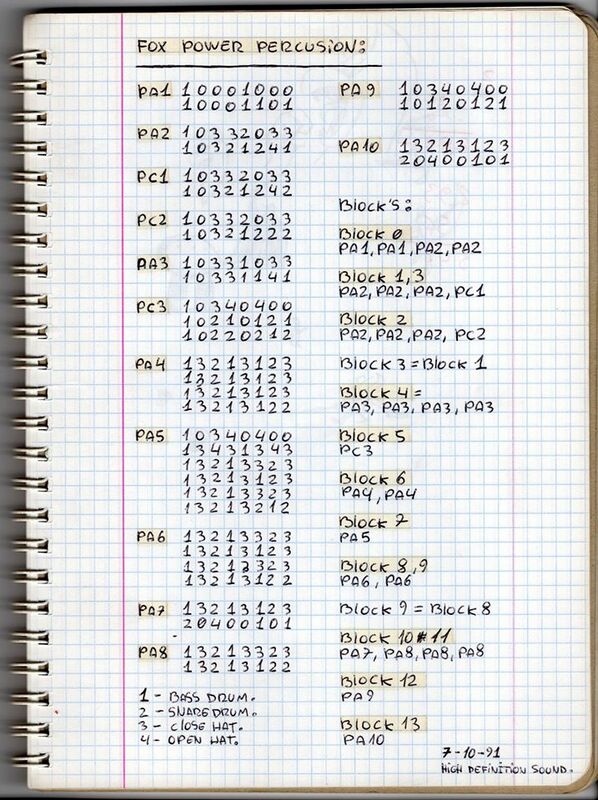 In one of my old notebooks I have found the percussion tables I wrote for my second Game Boy tune ever, which was never released. I did this in the quarters while doing the military service and I had no access to the computer or the console, but that didn’t prevent me from writing down the drum sequences in my own way. Photocopy of the original design documents from The Smurfs for Game Boy. 12. At Bit Managers, during the development of Asterix & Obelix for SNES (~1995).